Who knew Flats could be so exciting! The world population keeps growing, a population of 11.2 billion is forecast for 2100. So, it is likely that more of us will end up living closer together. We find this especially so in cities where space is scarce. It really comes as no surprise than that an eighth of homes are flats! But that figure could easily rise as space becomes ever more a premium and we must make the most of high rise living! I guess we are extremely fortunate to have such a big property for our home. But flats can be quite exciting too as I have recently learnt! I found these interesting facts about this type of property from blocks of flats building insurance specialist Deacon. Housing was an issue with the rapidly raising populations so the Romans learnt to build higher buildings than those attempted before. These flats were called insulae, Latin for islands. 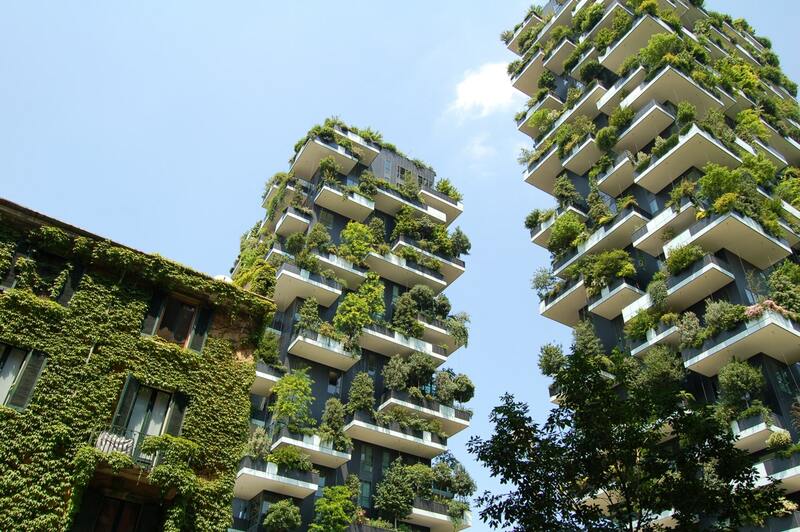 In Milan architect Stefano Boeri designed two apartment buildings covered in more than 20,000 trees and plants. It has such an amazing visual appeal and is a long way from the dirty rundown insulae in Rome. All those trees improve air quality just one of the reasons that these types of buildings are good for a city! A Paris flat was left frozen in time for 70 years after the owner Mrs De Florian abandoned before the second world war started. The untouched apartment was covered in dust but held an assortment of treasures. A Boldini painting of the owner’s grandmother (Marthe de Florian) sold for £1.78million!!! We are visiting Dubai next year sadly a little early to see these shapeshifting apartments due in 2020. Each owner will be able to control the rotation of their apartment! The project is expected to cost 1.2 billion, so these flats will be nothing short of extraordinary! The need for more housing has saved many landmark buildings from demolition retaining all the character and features that would be lost otherwise. These buildings are in prime city locations such as the BBC Television Centre where are one bedroom apartment would set you back £725,000. A Flat with A Train! A monorail in Chongqing, China goes through apartment blocks! It’s handy having a station in your own building, I guess. Plus, the idea is very original! However, I would worry about the noise and vibrations! Fortunately, the building has been made with absorbent materials to help! Jeddah Tower planned to be ready in 2020 will be the tallest skyscraper in the world! It will be 72 meters taller than the Burj Khalifa! On the opposite end of the spectrum in the Chinese city of Wuhan they have two-person apartments that are only 50 square feet! With land limited architects are investigating new possibilities like building underground or underwater! With 70% if the earth covered in water it makes sense to utilise that space. The Aequorea project intends to house up to 20,000 people in eco villages. A flat at One Hyde Park London was valued at £160 million! Apparently, this is the most exclusive address in London! I should think so at that price. So you see there really is nothing boring about flats!